R2-D2 makes the long journey to find Obi-Wan Kenobi. Giclee art print derived from the original Star Wars film. Signed, hand-numbered limited edition of a mere 150 pieces. Note the Jawa Sandcrawler looming eerily in the background! R2-D2 made the long journey to find Obi-Wan Kenobi alone, and this unframed Star Wars R2-D2 Artoo's Lonely Mission Canvas Giclee Print from Acme Archives depicts the off-screen adventures of the little astromech droid while Luke Skywalker slept in the original Star Wars film. 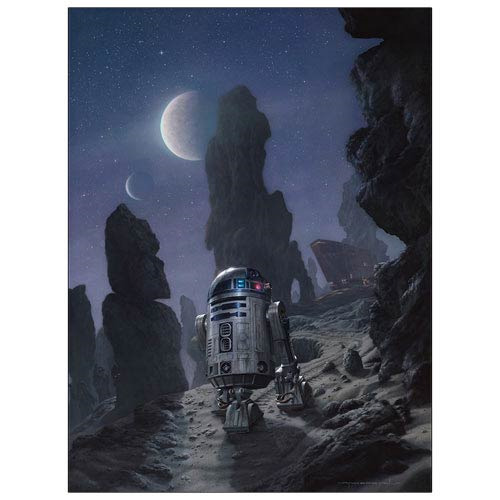 Featuring R2-D2 traversing the rocky expanse of Tatooine at night on his way to find his old master - with a Jawa Sandcrawler looming eerily in the background and catching up to Artoo's position - this deceptively tranquil giclee is printed on canvas and signed by the artist, Jerry VanderStelt. Measuring 24-inches tall x 18-inches wide, it's a hand-numbered limited edition of a mere 150 pieces that comes with a certificate of authenticity. Giclee (pronounced "zhee-clay") is an invented name for the process of making fine-art prints from a digital source using ink-jet printing. The word was coined to distinguish commonly known industrial "Iris proofs" from the fine-art prints artists were producing on the same printers. The name has since come to mean any high-quality, ink-jet print, and is often used in galleries and print shops to denote such. In the past few years, the word (as a fine-art term) has come to be associated with prints using fade-resistant "archival" inks and the inkjet printers that use them. A wide variety of substrates are available, including various textures and finishes such as matte photo paper, watercolor paper, cotton canvas, or artist textured vinyl. Ages 14 and up.